And do I have a gift for you! Are you looking for the perfect Valentine’s Gift for her? 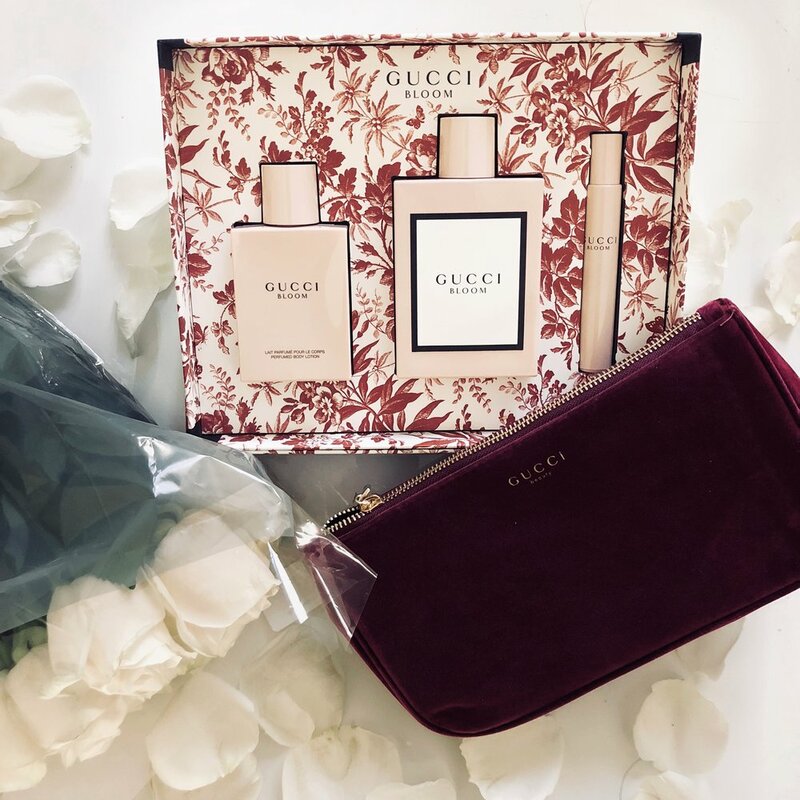 The Gucci Bloom Gift Set is the perfect gift this Valentine’s Day! This gift set retails for $129 and comes with a Gucci beauty bag as an additional gift with purchase. Although it seems quite pricy, it’s actually a great deal! This gift set comes with one bottle of the 100 ml Eau De Parfum, one bottle of the 100 ml body lotion, and the 7.4 ml fragrance pen. You're probably reading this saying "Really Cherry, $129?? Thats too much!" But it's literally a great deal! One bottle of the 100 ml Eau De Parfum retails from $95-$124. One bottle of the body lotion retails from $40-55. So for $129 you’re getting a deal to get all three! Also, with the additional Gucci beauty bag that comes with the purchase, it’s the perfect bag to put her favorite candies in, make up, or maybe even chocolate covered strawberries! (I mean come on, who doesn't love chocolate covered strawberries on Valentine's Day!). I love fresh and floral scents so the Gucci Bloom has definitely been added to my favorites list! If not for a Valentine’s Day gift, I would recommend it as a must have. We all have our preferences when it comes to fragrances but again, if you’re looking for a romantic/soft/floral scent, this is one to have! Jan 30 Cherish the moment.